Understanding each client is unique. j+k fitness studio offers fully customizable workout programs and experiences for individuals and partners with our specialized personal trainer’s. Together our team of the best personal trainer’s possess an impressive range of certifications and credentials as well as an in-depth understanding of the human body. Most profoundly, we share an unwavering commitment to our clients and helping them reach their fitness goals safely and efficiently from weight loss(, gaining lean muscle mass or just overall health. Acknowledging that no two bodies are alike, we resist creating generic workouts for the masses. Instead, we reverse the pattern by creating personalized and challenging workouts based on the individual client’s body type, fitness goals, and past or current injuries, all while incorporating the most current and advanced training methods. We view fitness as a way of life, not just a peripheral activity. With our guidance and training expertise, we hope clients will be able to discover ways to practice healthy eating and exercise habits, long after training at j+k is complete. We focus on delivering real and sustainable RESULTS for our clients. We are also invested in the process of reaching those RESULTS since this is just as important. While each of our trainers is unique as our clients, we all stand behind the j+k fitness process. 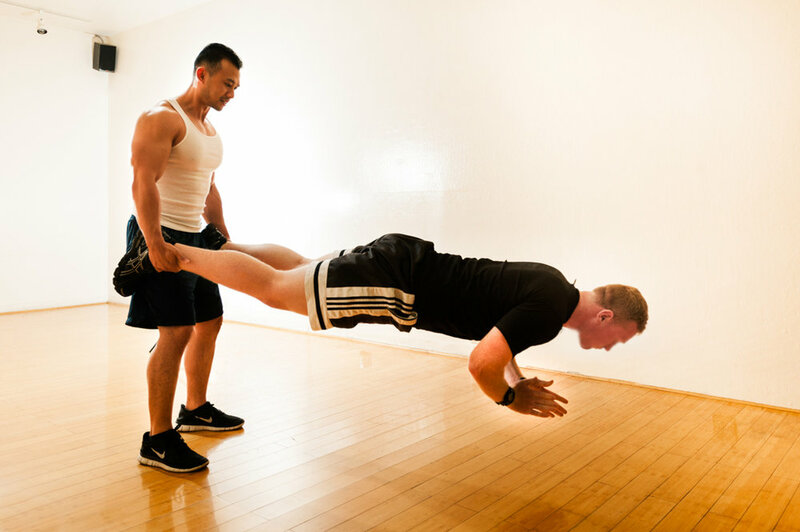 Our personal trainers generate the most effective workouts for our clients, utilizing information gathered about their lifestyles, injuries, fitness goals, levels of commitment, and past training experiences. Initial measurements and assessments are used to determine any imbalances, muscle movement patterns, proprioception, and muscular endurance under certain conditions. Based on results from the clients’ assessments, our trainers design personalized workout programs that incorporate aerobic and anaerobic training, balance/mobility training, strength training, interval work and injury prevention. Moving through low to high intensity exercises, each training session is intended to be progressive. This gives the body ample time to respond to new stimuli, acquire new muscle memory, build endurance, and prevent any serious injuries down the road. Our trainers advocate for clients even after workout sessions are done for the day. We make ourselves available to answer any questions you might have about diet, nutrition, and your fitness progress. We train collaboratively and as a team at j+k. Each of our trainers work closely with clients to develop the most optimal workouts. Rotating through different trainers enables clients to progress more rapidly(if the choose) Since each trainer possesses a unique skill set (rehab training from an injury, sports-specific training, boxing, power lifting, functional training, or some combination), clients can experience the benefits of a diversified workout program.